I've been backpacking for 45 years on and off, and regularly in the Rockies since 1986.� I do a weeklong trip every summer, and often take three-day trips.� I'm usually camping in alpine terrain, at altitudes 5000 to 13000 ft (1500 - 4000 m).� I prefer base camp backpacking, a long hike in with day trips from camp, but I do my share of forced marches too.� Though always looking for ways to reduce weight, I'm not yet a lightweight hiker and I usually choose a bit of extra weight over foregoing camp conveniences I've come to expect. Chugach Booties are the middle child in Nunatak's family of down footwear.� They are mid-calf booties marketed as camp shoes for cold weather outings. Size: XL; available in unisex sizes XS-XXL.� The Chugach page on Nunakak's website includes a sizing chart for men and women. MSRP: XS-XL, $131 US.� XXL, $144 US. Materials: 800+-fill goose down insulation.� EPIC by Nextec rip-stop nylon shell fabric.� As noted in my review, other fabrics are available. Color: Green.� This color is no longer available in EPIC.� Available colors depend upon the customer's fabric choice and Nunatak's inventory. Nunatak is a custom maker of down-filled sleeping bags and garments with a decided bent toward ultralight gear.� While it lists stock products, the company welcomes and strives to accommodate requests for customization, as the other reviews of Nunatak gear on this site describe.� On listed products the customer selects fabric from those available in inventory.� At this writing that includes five different fabrics ranging in weight from 0.8 to 1.7 ounces per square yard of fabric (27.0 to 57.4 grams per square meter).� Nunatak recommends that all footwear be ordered in EPIC, its toughest and heaviest fabric, but does list weights of the Booties in its lighter fabrics. The Booties are almost always part of my kit on any backpacking trip when I expect temperatures to drop below 20 F (-7 C) or snow on the ground in camp.� Over the past two years that has included snow camping in Wyoming and Montana, winter backpacks in Texas and Oklahoma, and several hut-to-hut or yurt ski tours in Colorado, Wyoming, and Idaho.� Most recently, I wore them winter camping in Yellowstone Park last December, with a nighttime low of 7 F (-14 C).� Immediately after that overnight I took a course at the Yellowstone Institute, living in a (somewhat) heated cabin that had no plumbing, so I wore the Booties on trips to the community bathhouse and as "indoor shoes" during the course.� The temperatures had dropped to more normal Yellowstone winter conditions, below -20 F (-27 C) at night.� The coldest temperature I can recall when wearing the Booties was a yurt trip in Idaho at Christmastime 2007 during which the mercury read -28 F (-33 C). Once I reach a winter camp I change into dry socks and the Booties as soon as I can get out of my ski or touring boots.� I usually carry extra socks for safety and psychological reasons, in addition to winter "sleep socks" that I store in my sleeping bag and use only when I'm ready to retire to the sleeping bag for the night.� So when setting up camp � digging a vestibule, flattening a tent site, gathering firewood, and most other activities that may have me dashing through the snow � the Booties are still in my pack.� I consider them camp shoes and an occasional supplement to my bedtime insulation, and not intended for many camp chores beyond preparing meals. When staying in a hut or yurt I wear the Booties from arrival to departure; they are great footwear for these often-drafty and sometimes unheated shelters.� I'll keep them on for bathroom trips and light chores in the snow rather than change back into ski or hiking boots.� I've tried them as slippers at home but my feet get too warm when I do. I've kept the inside soles supplied with the Booties, not replacing them with an aftermarket product as I do with hiking boots.� The Nunatak inners are stiff and together with the ToughTek outer soles have insulated the soles of my feet quite well from the snow or cold ground on which I'm walking, though after extended outdoor time the bottoms of my feet begin to chill long before the sides.�� Should I ever plan an arctic expedition or extended winter backpack I'll consider purchasing or making a heavier inner for even better insulation. Nunatak's standard width exceeds that of my rather narrow feet.� A rand does brace my heel somewhat, but these are soft shoes that give no lateral support.� Hence my feet move about considerably when I'm wearing the Booties.� Nunatak's website indicates that the Booties now have "An additional elastic band by the ankle" for "superior internal fit control. "� I must tread carefully to keep my footing when post-holing through lightweight Rocky Mountain powder.� This isn't a real problem, I just have to think about it to avoid a fall.� This is one more reason I limit my use of the Booties to camp and hut shoes. Ice is another matter.� The soles get a decent grip on snow but not on ice or hard-packed snow and lack of lateral support only makes balancing that much more difficult.� Without cleats or crampons this is an issue even in my winter boots, even more so in ski boots, and not something for which any camp shoes are intended. Nunatak, like every manufacturer of EPIC gear I own and Nextec itself, takes pains to advise that this fabric is not waterproof, only water resistant.� Particularly with the Booties I think this description is unduly conservative.� Water generated by body heat or an external heat source melting snow seems unable to penetrate the outer fabric, even at the seams.� The Booties' weather-worthiness has been amazing.� I cannot recall even one damp patch of down, even after fifteen minutes in the snow followed immediately by sitting in front of a hot stove inside the yurt.�� I'm not planning on wading through a creek or splashing through slush in the Booties, but for the purposes I use them I consider the Booties waterproof, period. The Booties have proven as durable as any gear I've ever owned that has been expressly marketed as lightweight.� Occasionally I'll see a feather escape at a seam, but after two winters' use the Booties look almost as good as new.� No slashes, pinpricks, or other break in the integrity of the outer or inner shell that might compromise waterproofing or down protection.� I consider that remarkable, given that I've worn them around camp in colder non-snow situations, thus exposing them to rocks, twigs, brush, and similar hazards. I've washed the Booties several times at home, always by hand in cold water with down-specific soap.� After a light massage to get rid of any small down clumps I air-dry them; in Texas's dry climate this takes about 48 hours.� Twice I have given the inner soles a bath in MiraZyme (a mildew remover), and I've never had a problem with retained odor. 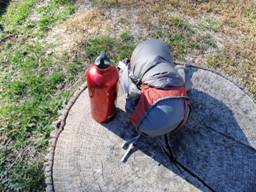 Here's a picture of the Booties in a stuff sack (my own; Nunatak does not include one), which is how they live in my pack.� Even with their hard soles I can get them down to water bottle size. They keep my feet warm always. A stiffer rand for better� stability when walking. 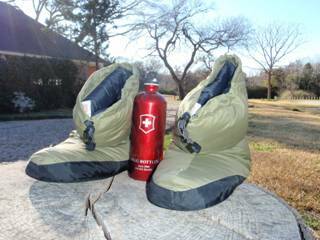 The Nunatak Chugach Booties have been one of the most welcome items in my pack when it's cold outside.� For my usual winter excursions they are terrific foot warmers.